It’s no secret that Sriracha is my favorite hot sauce. I put it on everything, eggs, mashed potatoes, hamburges, noodles, pulled pork, popcorn, and it’s my special winning ingredient when I custom blend BBQ sauces for competitions. When a co-worker mentioned that the company provides free factory tours of their huge 650,000 sq. ft. plant in Irwindale, 30-minutes east of downtown Los Angeles, I could not resist. 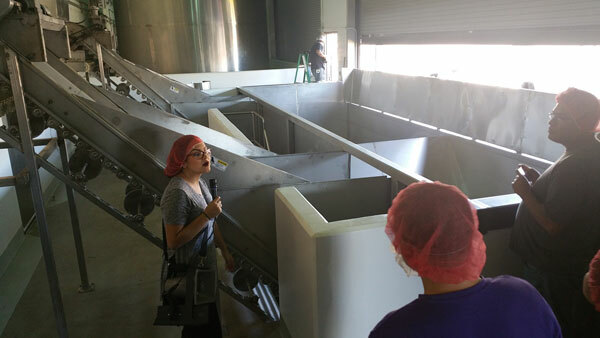 Yes, the sauce is awesome, and yes, the production facility is impressive and yes, it smells like peppers. But what really captured my attention is the back-story because I also arrived in the US about the same time as the founder David Tran. Tran has a true America success story, and, as a first-generation immigrant, he inspires me. Tran came to the United States as a Vietnamese refugee with no job and no sauce. He had a limited education, but he had good instincts and a great head on his shoulders. He wasn’t planning to open a business when he arrived in America, but after a few months in the states, he saw a void. He couldn’t find a hot sauce he thought was worthy of Vietnamese Pho soup. He soon realized that the Southeast Asian community in Los Angeles was suffering from the same hot sauce withdrawal. He set up shop in Chinatown in Los Angeles and named his business Huy Fong after the name of the freighter that took him and 3,000 other refugees out of Vietnam. Huy Fong means “gathering prosperity” and the famous white rooster logo was used because Tran was born in the Year of the Rooster on the Vietnamese zodiac. He initially created two products Sambal Olek and Chili Garlic sauce in baby food jars. Sambal Olek is a full-bodied sauce with the pure taste of chilies and Chili Garlic is a thick, chunky style hot sauce with a hint of garlic flavor. 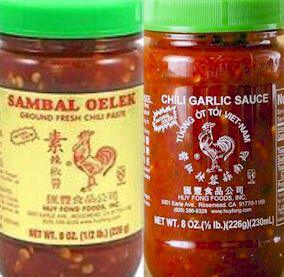 These two “parents”, Sambal Olek with chili and vinegar, and Chili Garlic with chili and garlic, later gave birth to Sriracha which has chili, vinegar, and garlic from both parents. His now-famous hot sauce made with hybrid jalapeño peppers (red or sometimes orange in color), vinegar, sugar, salt, and garlic quickly took off in sales. Today, the child Sriracha sells more than both parents combined, earning the company about $60 million dollars in sales. When you take the free company tour (which I suggest you do! ), the first thing you do is walk into the tour waiting area which is actually a big wood-floored ballroom dance hall (Tran is passionate about dancing). As you make your way through the tour, you learn his fascinating story. 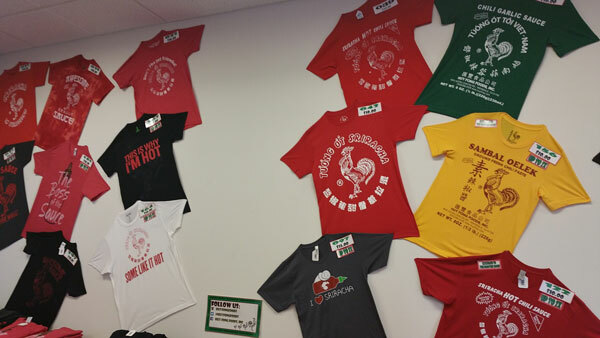 In the early years, even as word spread of his products, Tran wasn’t looking to start a company in America and continued to deliver Sriracha to local markets and restaurants. 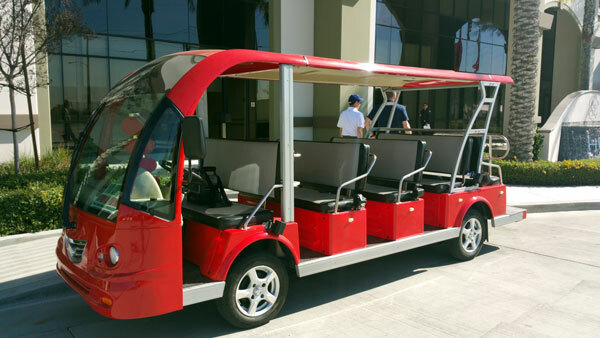 When he finally opened his first manufacturing facility in Rosemead, California, he had a good idea of how he wanted things to be done. Although Tran received only basic education, I can tell he thinks like an engineer. For example, he developed his own way of moving drums around the factory, and when the time comes for new equipment, Tran often tells the engineers exactly how it should be made. 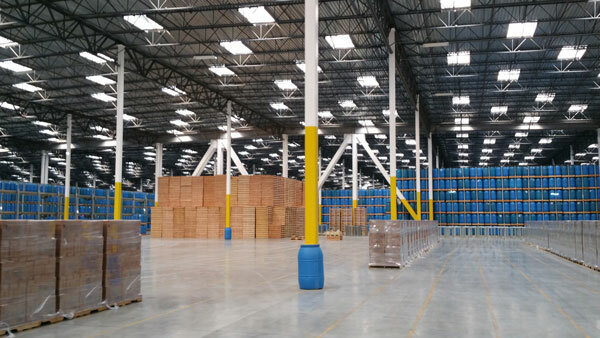 For example, he designed the loading dock where a continuous stream of trucks delivers 100 million pounds of freshly harvested chilies which will last the entire year’s sales. Quality is of utmost importance and Tran has always been unwilling to compromise on quality. For 20 years, the company’s only chili supplier has been Craig Underwood of Underwood Family Farms based in Ventura County, California. He knows he can depend on them for quality and care. Because Underwood Family Farms only sells to Huy Fong, Tran’s recipe can never be duplicated. 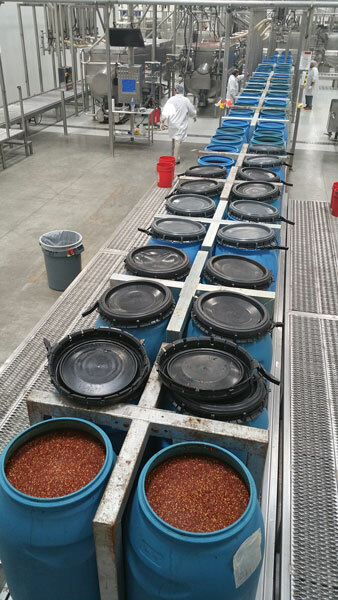 Harvest season runs about 10 weeks starting in August and the red peppers are picked and delivered to the Irwindale plant, washed, and ground up with vinegar into a chili slurry within 4 hours. The slurry is never cooked before being piped to be aged in 55-gallon blue plastic barrels piled 30 feet high in the warehouse. During the year, the process is reversed as the slurry is piped back to filing stations where the chili base will have garlic and sugar added. 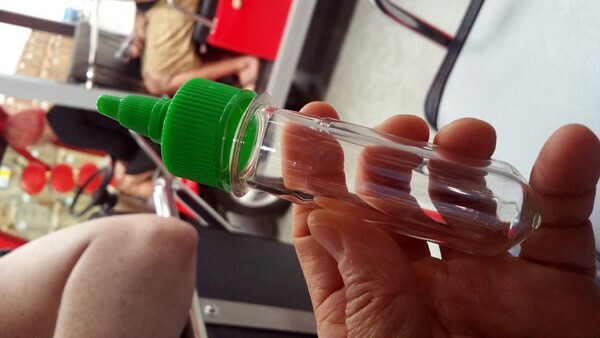 During the tour, I watched the blow mold machines create the Sriracha signature clear plastic bottle with white graphics and lettering. 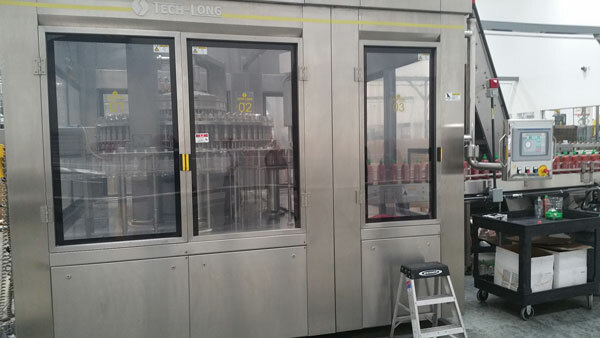 From a test tube shaped pre form, the machines use heat and air to create the 3,000 per hour or 20 million bottles of sauce a year. Supply never meets demand. Tran doesn’t want to advertise, because he knows he can only deliver what the harvest brings. Despite the fact that demand gives him great leverage, he has never increased the wholesale price of Sriracha to his dozen wholesale customers. There are no salespersons and his customer base has not changed as he does not accept new customers. Information about the secret sauce is spread only by word of mouth. Sriracha sales last year reached $60 million dollars, and percentage sales growth is in the double digits each year. For me, Tran’s story has so many lessons. For example, he wasn’t entrepreneur; he was simply following his passion…are you? He’s an inspiration for me since I’ve started making my own Slap Yo Daddy sauces because I couldn’t find a flavor I liked. Tran clearly had good instincts…are you taking advantage of yours? I have no formal cooking school training but I follow my instincts when I compete in contests or TV shows. Tran didn’t let his lack of education get in his way…that made me ask myself whether I’m allowing perceived stumbling blocks to prevent me from taking risks? Tran is fully committed to quality, so his fan base has followed….that made me redouble my efforts to improve my Slap Yo Daddy rubs and sauces to make them better than ever. Need some immediate inspiration? 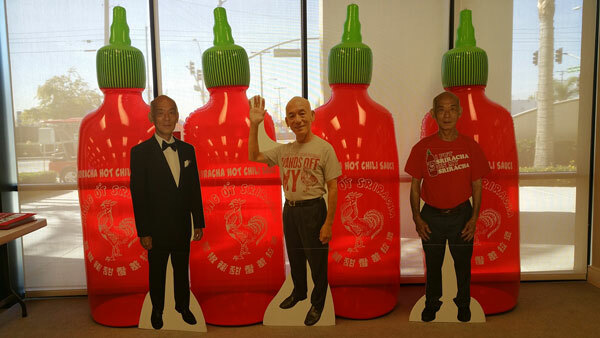 Get some Sriracha and follow David Tran’s success story. I’m going to. 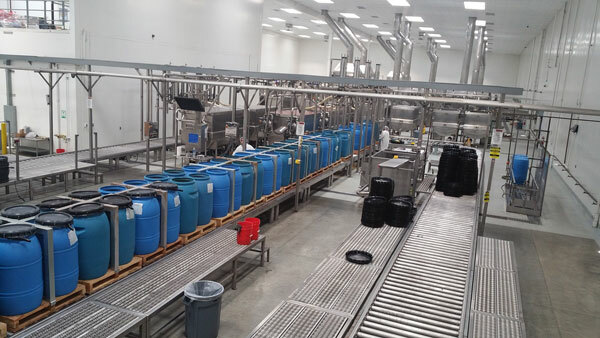 All it took was one factory tour and the inspiring story of one man’s quest for the perfect hot sauce. This is a wonderful success story and I love this Sriracha. They have it at our local gastropub and I have bought a couple bottles for the house over the years. My hot hot taste buds are tamer than most, so I have made spicy mustards and mayos with it mainly or straight up only on Korean style beef sandwiches. Harry, can you give a couple hints or suggestions on mixing strategies for sauces or glazes with Sriracha? No need to give away all your secrets, but perhaps a little guidance or tip is all I am looking for. Thanks for sharing your passion and this wonderful story. Glad you enjoyed reading the article. Excellent article…and excellent observations. That is not only inspiring, but does serve as a reminder to many of us. Thank you for sharing. Oh, and I’ve had a bottle or two of Sriracha in my house since discovering it many many years ago. I wouldn’t be without it. I always keep two open ones in my fridge and 2 new ones in the pantry. Love this hotsauce! I’m always using sriracha when grilling. Great post, especially with the images! I’m going to pass this article along, keep up the great work. Great article, its so inspiring, keep up the good work. Thanks for the comment and support! Glad you liked the story. I clean BBQ Grills for a living and give a homemade sriracha style bottle to all of my customers. They love it and say I should go commercial with it but it seems like a lot of red tape. I want to go on this tour badly now! Great article and thanks for sharing! Thanks for the shoutout. I say have sauce will travel and encourage you to get your sauce out to the world. 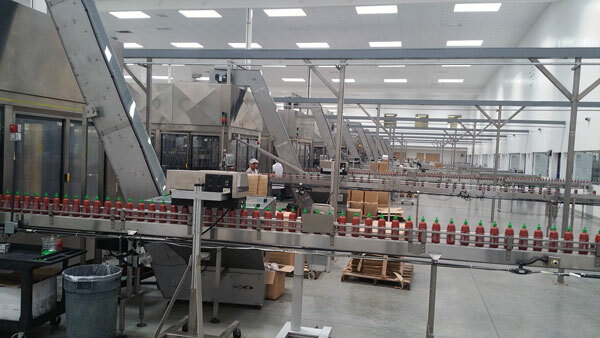 If you plan a trip to visit the Sriracha factory, try around August/Sept as I think that’s when they roast the peppers so there will be more to see. I’m going to see about going there in Aug 2018.